Anthony Price and his Los Angeles Rams never looked like they were in trouble as they cruised to a 20-3 win over Perry Burke and his Dallas Cowboys. Leading up the SHOW XVI, it looked like the Cowboys were on a mission. They blow out the 49ers and Raiders to get to their second SHOW title game. On the other hand the Rams struggled with the Eagles before putting them away to reach their second SHOW final. The consensus was Cowboys in a landslide, but someone forgot to tell coach Price and his Rams. From the opening series it was apparent the Cowboys had no answers for the Rams defense nor the offense. The Cowboys went 3 and out on their first series and the Rams went right down the field and scored. Eric Dickerson broke a run of 62yds and the Rams offense went into another gear and two plays later were in the endzone on a Todd Gurley 10yd reception. Extra point was good 7-0 midway through the first quarter. The Cowboys ensuing drive started off promising. A run of 37yds followed by a Dak Prescott 3yd run had the Cowboys making some noise. That was short lived as Prescott and the offense who were hot coming into this game suddenly went cold throwing the ball. Their next three plays were incomplete passes and the Rams had the ball and wasted little time getting back into the endzone. Vince Ferragamo had two runs of 24 & 22 yds followed by a touchdown pass to Eric Dickerson for 30yds. The extra point was good and after the first quarter the Rams were up 14-0 over the Cowboys. The second quarter wasn’t any better for the Cowboys and coach Perry Burke. Still missing passes and giving up on the running game way to early the Rams defense set their ears back and just kept coming in waves. In total they had seven sacks of Dak Prescott. During the regular season the Rams got to Dak 10 times. In two games the Rams recorded 17 sacks and held the Cowboys to 3 points in each contest. The Rams scored to close the scoring in the first half on 59yd pass play. They missed the extra point and lead at halftime 20-0. The second half of the game was just a defensive struggle. The Cowboys scored to avoid the shutout on a 51yd field goal. When the final seconds ticked off the clock coach Anthony Price and his Rams were victorious 20-3 and now he joins the twice is nice club. Dave Campbell, Robert Jackson, Marcello Troilo and Eric Robinson and now Anthony Price belong to this club. The final stats: The Rams rushed for 123yds on 12 carries with a long run of 62yds. The Cowboys rushed for 53yds on 5 carries long run of 37yds. Passing stats were Rams 117yds with three touchdowns on 5 of 8 passing. 59yds was the longest pass completion and that went for one of the three touchdown passes. The Cowboys went 3 of 10 for 98yds. They were sacked 7 times for -23yds. Neither team converted a third down the Rams were 0-2 and the Cowboys were 0-5. The Rams converted their lone fourth down try the Cowboys went 0-2. Two Ram players had two sacks each while one Cowboy lead his team with three tackles. Reporting for the LAEFL this Rastahaze and this was the SHOW according to me. See you at the Open Run the second weekend of October. Great write up Rasta! 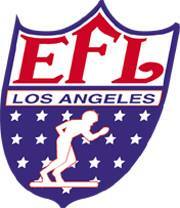 Congrats to the LAEFL 2018 Champs…Coach “Ant Price” & those LA Rams!! !